Am doing my civic duty this weekend and dedicating batches of baking to the Milwaukee police precinct in my neighborhood. Still paying back the officers who tended to the emotional havoc I experienced after being held up by a gun-wielding youth a few years ago. The Milwaukee Police Dept. has been getting a lot of bad press lately. But they have a tough job. And they’ve always been kind to me. Anyway, I’ve been making these for years. I got my first taste of them while an editor at Better Homes and Gardens. Then again after I became editor at Taste of Home magazine when we sent batches of these to soldiers (slightly different recipe). They pack well and hold their flavor for a looong time. 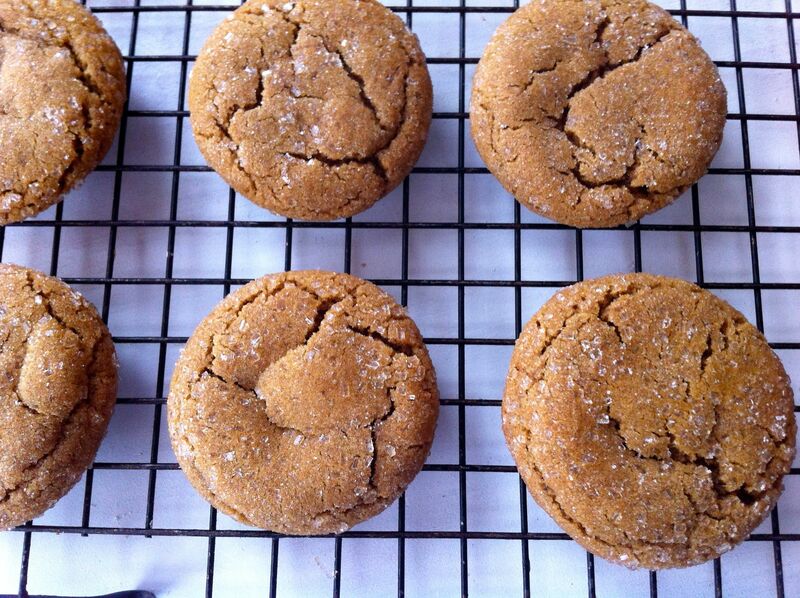 Ginger, cinnamon, cloves. Oh, yeah. I can’t take credit for this version. It may have originated from BH&G; or come from a Taste of Home reader…and it’s all over Pinterest, so who knows? I always tweak recipes, so maybe it’s mine now! 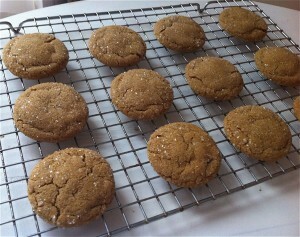 I sometimes use my 1/4-cup size ice scream scoop and make GIANT ginger cookies. If you want to go that route, increase the baking time by 2 or 3 minutes. And you will only get a couple dozen big ol’ cookies out of the batch, rather than about 5 dozen cookies. 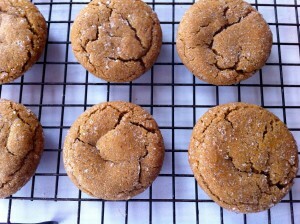 Preheat oven to 350° F. Stir together the flour, ginger, baking soda, cinnamon, cloves and salt. Set aside. In a large bowl, beat shortening for about 30 seconds. Add the 2 cups sugar and beat until combined. Beat in eggs and molasses. Add flour mixture and beat until combined. Shape dough into balls (I made these exactly 1 tablespoon per ball), and roll them in the remaining sugar. Place about 1 1/2 inches apart on an ungreased cookie sheet. Bake for 9 minutes. Tops will be slightly puffed and soft. Don’t over bake. Cool for 1 -2 minutes before removing from cookie sheet to rack.